If you've ever read articles from the USA about saving money on groceries and other items, you may have noticed they talk about how items go on sale in a cyclical fashion, every 6 weeks or so, or how there are better and worse times to buy specific items - Broadway tickets in February, Christmas decorations after New Years, etc. Unfortunately, sales tend to happen in a much more haphazard way in Israel (pretty much like everything else here ;-) ). 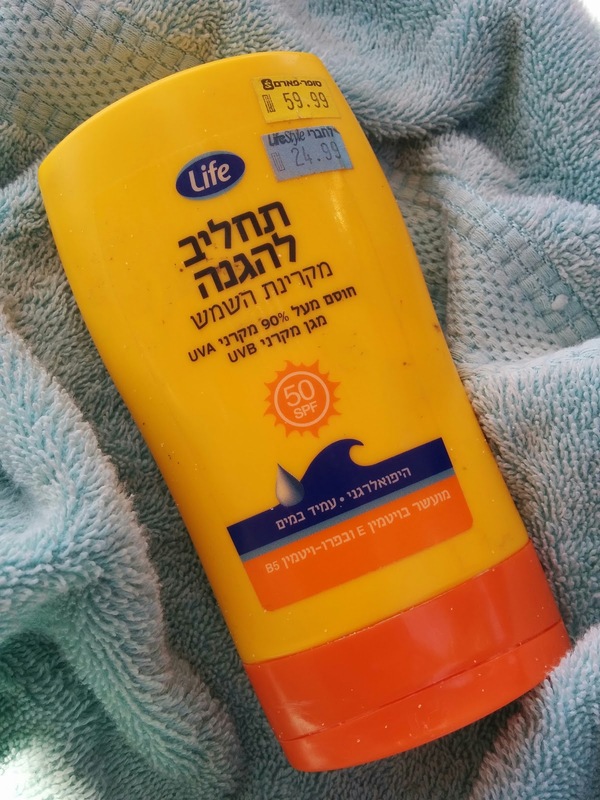 However, while there don't seem to be any hard and fast rules, there does seem to be a trend regarding prices of certain items at specific times of the year, often according to the Jewish calendar. If the item in question isn't perishable, it's a good idea to stock up on it for use in the next year - or at least until the item goes on sale. Even if it's a perishable, but you can freeze it, it can be worth it to stock up for the next several months. School supplies: Late August and early September is the time to get them in bulk and at a discount. Some stores will provide additional discounts once we're about a month into the school year or after the chagim, especially on yomanim and some branded merchandise (Anna and Elsa stickers won't be popular forever, after all). The problem is that the selection is smaller by then, but that's a matter of taste. Suntan lotion and beach towels: August means that soon the demand for these will be diminished, hence the sales on these items. 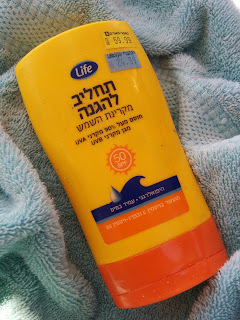 The suntan lotion in the picture above has a use-by date of 30 months from when you open it, so feel free to stock up for next year, and the year after that. Honey: Rosh Hashanah sales can be an attractive time to buy honey in 1kg jars. but you can enjoy these discounts (and possibly better ones) until Chol Hamoed Sukkot. Despite what's written on the label, Honey doesn't expire. Canola oil: Sales usually occur during the weeks before Rosh Hashanah and Pesach. Olive oil: Olive oil for eating (e.g., extra virgin) can be found on sale in different places at different times. The regular price is on the order of NIS 40-45 per liter, but you can catch olive oil being sold for as little as NIS 20 per 750ml (or NIS 26.67 per liter). Be an opportunist and stock up if you use it regularly. Superpharm also has a recurring coupon for 750ml of olive oil for about NIS 22, but you can only buy one unit at the coupon price. Olive oil for lighting (and Chanuka candles, and tapers, and other lighting paraphernalia) go on sale towards the end of Chanuka. If you light Shabbat candles with oil, that's a great time to stock up. Wine: Many supermarkets offer special deals on wine (e.g., 4 bottles for NIS 100) before Rosh Hashanah and Pesach. Non-aged wine (which is what most of us drink, unless you're a real connoisseur and spend hundreds of Shekels per bottle) lasts at most 2-3 years before turning into vinegar; keep that in mind when stocking up. Seasonal produce: Early and very late in the season, prices soar. They reach a nadir slightly after the height of the fruit's or vegetable's season. Try to buy your favorite seasonal fruits and veggies then, as they're also likely to be at their tastiest as well. Make preserves from the surplus, or cut up and freeze for smoothies for the rest of the year. Cleaning supplies: Before and often also during Pesach. Fresh chicken: You're most likely to snag a deal on this between Chanuka and Purim. (I have no idea why this is, just an observation). Salmon fillet: Supermarkets often have these on sale before RH and Pesach, and also around Shavuot. Dairy products: Also, around and after Shavuot is the best time to find deals. Yellow cheese can be grated and frozen for the next few months, and you can also freeze milk bags (though they may leak upon thawing due to expansion of the ice in them). If you've noticed a price trend in a consumer good not mentioned here, Please either comment or email me (at saveourshekels-at-gmail-dot-com) - I'll happily add it to this list!